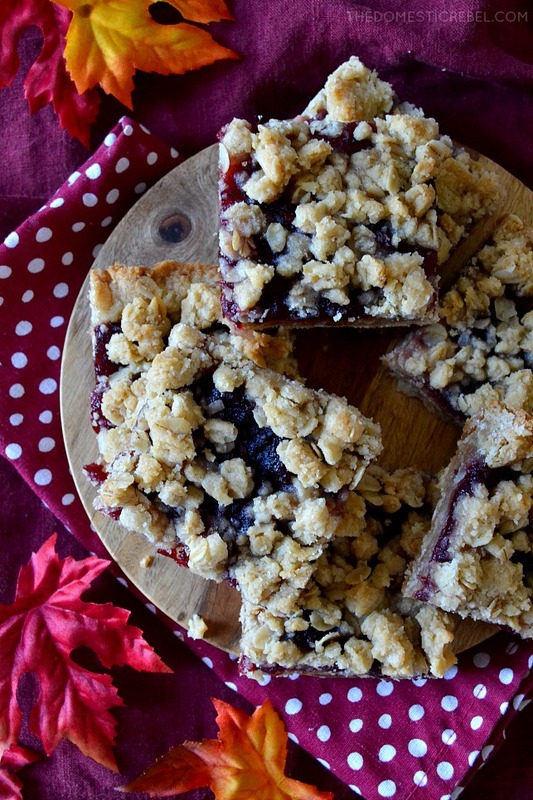 A great way to use up leftover cranberry sauce, these Cranberry Crumble Bars are easy, convenient, and delicious! I am usually not a big leftovers person… it’s in my genetics. Basically, my parents didn’t really cook for us growing up because they were busy and had better things to do. So we went out to eat a LOT, and if not, we’d have something like hot dogs with Kraft mac & cheese or a Hamburger Helper situation for dinner that would never warrant any leftovers. So because we never usually had leftovers, I never got into the whole “leftovers are the best” camp that so many people are in. Especially when it comes to leftover boundaries, for which I have none. ‘Leftover boundaries’ are basically rules set up by adventurous folks who have a lot of experience with said leftovers. Like for instance… how do you know leftover chicken from Monday will still be good on Thursday? Is that a thing? Won’t you get like, tuberculosis and die on Friday for eating spaghetti made on Sunday evening? Don’t even get me started on meal prepping… HOW IS THAT CHILI SUPPOSED TO BE GOOD BY FRIDAY, DEBRA? I’m not sure my parents were raised with leftover-loving parents, either, because when it came to leftovers, my mom was pretty much throwing them out constantly. Say we’d have kielbasa and fried potatoes on Friday. Saturday they were still technically okay, but by Sunday all bets were off and they were basically toxic waste. Just like the whole “sell by”/”use by”/”best by” dates on things. If our gallon of milk said “best by 11/5” my mom already had a new gallon by 11/4 because we didn’t dare take our chances with old milk. So basically when it comes to leftovers, I’m in the “huh? ?” camp. I don’t know what’s going on and I can’t bear to contract the black plague from 2-day old fried rice. But, I know with Thanksgiving coming up there will be LOTS of leftovers… including leftover cranberry sauce. If you’re in the cranberry-from-a-can camp like I am, you usually over-buy canned cranberry sauce thinking you’ll make a million turkey sandwiches for weeks to come. 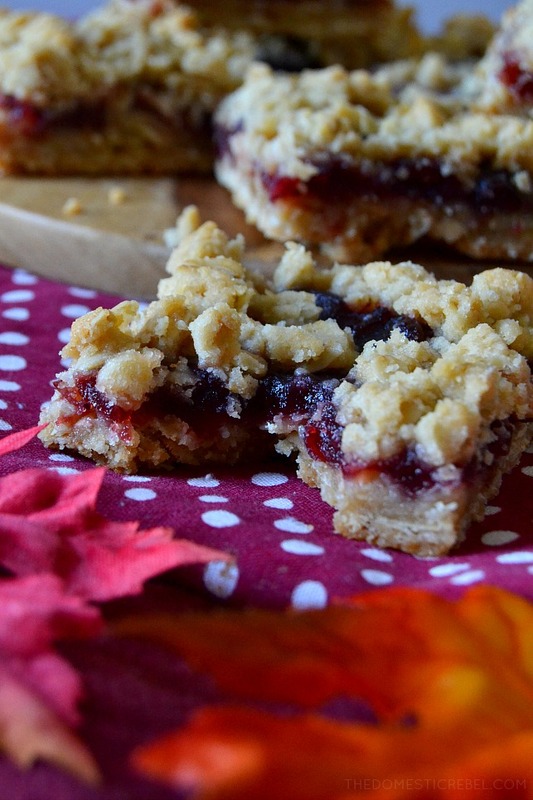 But I’ve gotcha covered with that leftover sauce, and it comes in the form of these Cranberry Crumble Bars! Made with a oat cookie-type base, they’re filled with an entire can of whole berry cranberry sauce and topped with a sugary oat streusel. 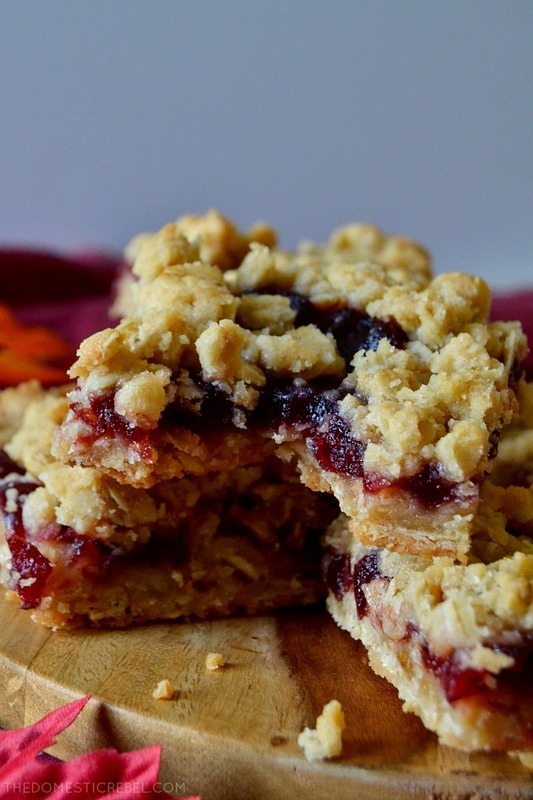 You can totally customize these bars by making them with homemade cranberry sauce, by adding in orange zest to the filling, or dicing up some nuts for the streusel. The world’s your cranberry, people! I just love that this A) solves the leftover cranberry sauce crisis after every Thanksgiving; and B) tastes incredible! 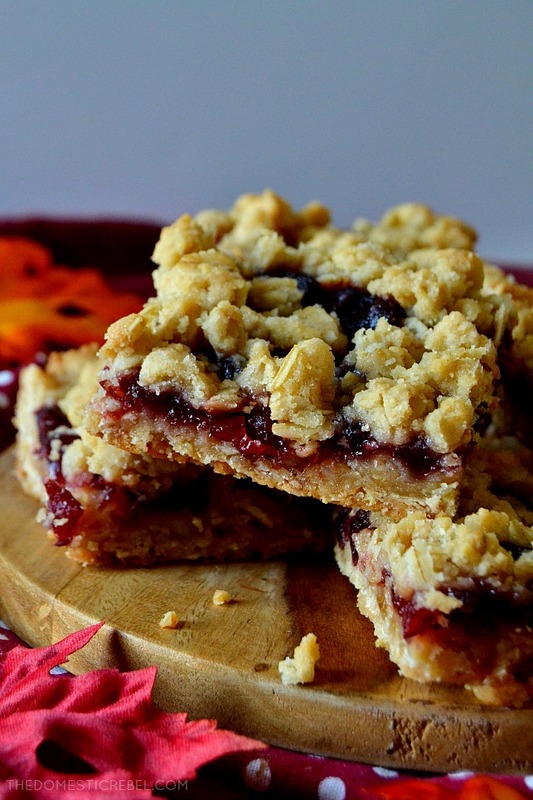 Tangy and sweet cranberry sauce with hearty oats in a soft and chewy bar… nothing better! 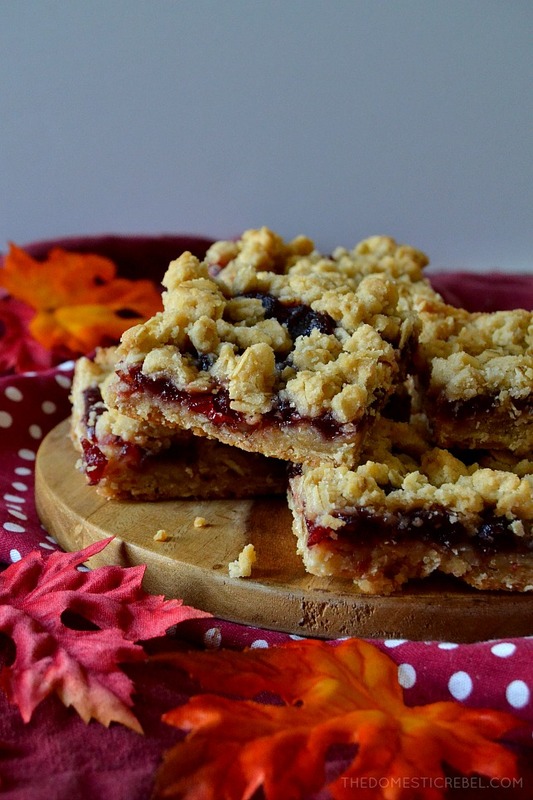 Tart and tangy cranberry filling mixed with a buttery, brown sugar & oat streusel for a hearty and delectable bar that’s great on-the-go or for holiday cookie trays! 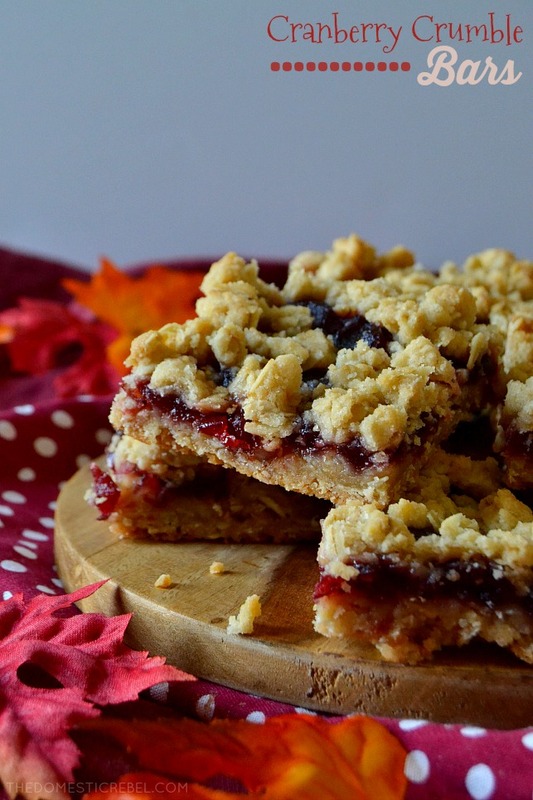 These Cranberry Crumble Bars help to use up any leftover cranberry sauce and make for a soft, chewy, and delectable bar featuring tart and tangy cranberry sauce and a delicious oat streusel! Preheat your oven to 350 degrees F. Line a 9×13″ rectangular baking pan with foil, extending the sides of the foil over the edges of the pan. Spray the foil liberally with cooking spray; set aside. In a large bowl, combine the melted butter, sugars, and vanilla and whisk to combine. Mix in the flour, oats, and salt and mix together until moistened and combined; mixture will have some large crumbs throughout as well as some dryer parts. Reserve 2 cups of this mixture. Press the remainder of the mixture into the bottom of the prepared pan in an even layer. Top with the cranberry sauce and spread out almost to the edges – but keep a ¼” barrier/edge of the oat mixture closest to the pan as the cranberry sauce will scorch. Top with the crumble. Bake for 35-45 minutes or until the center and edges appear set and the top is light golden brown. Cool completely, then cut into bars. I mean, how gorgeous are these? !